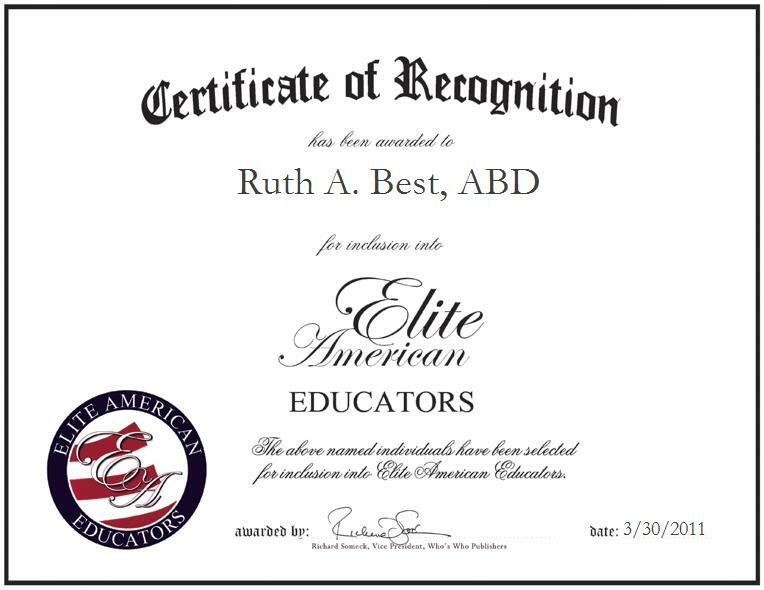 Mount Vernon, NY, March 30, 2011, Ruth Best, Assistant Professor at The College of Westchester, has been recognized by Elite American Educators for dedication, achievements and leadership in higher education. Over the course of her career, Ms. Best has learned that she holds a great desire to share her knowledge with others. She demonstrates a proven expertise in coaching and mentoring the next generation of teachers as an assistant professor at The College of Westchester. During each semester, she teaches four courses in business and general education at the associate and bachelor’s degree levels. She instructs students enrolled in statistics, mathematics, introduction to business, principles of marketing and management, consumer behavior, and critical issues in business. Ms. Best became involved in her profession through her experience teaching elementary education in Barbados after graduating from junior college. Pursuing a doctoral degree in teacher leadership, Ms. Best intends to supplement a Master of Science in special education from City College. In addition to these degrees, she also holds an MBA in financial management and a Bachelor of Science from Pace University and Concordia University, respectively. Active within her professional community, she is affiliated with the American Educational Research Association, ASCD, the Council for Exceptional Children and Phi Delta Kappa International.